This giveaway is now closed. Thank you!! Logan and I were lucky enough to get a sneak peak at the new Cars 2 movie in 3D yesterday. It opens in theaters June 24th! We had so much fun and we both really enjoyed the movie. My three year old reviewer gave it two thumbs up. After watching the movie, he said, "Thank you for taking me to the Lightening McQueen movie 'feater' (theater)." I asked him his favorite part and he said, "All the crashes!" I had worried a little that it would be too much of an "action" film for him. We haven't let him watch shows with shooting or explosions yet, and I thought he might be scared. Nope, he loved it. Guess he's not such a baby anymore -- even though I want him to be! If you want to check it out before letting your kids go see it, this clip is a good example of the level of intensity. Disney has been so generous and they are now willing to share that generosity with one of my readers! One reader of Ready.Set.Read! 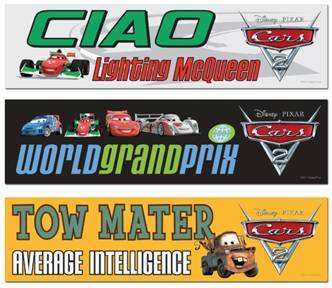 will have the opportunity to win a Disney Cars 2 prize pack, courtesy of Disney. 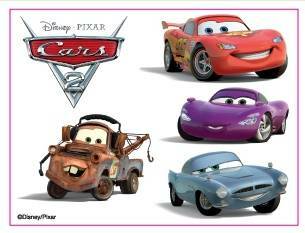 Leave a comment sharing your favorite Cars Movie character or a comment naming your favorite character from any Disney movie. Subscribe to Ready.Set.Read in a reader. This giveaway will end on Friday, July 1, 2011 at 10 pm CST. The winner will be chosen through random.org. I will notify the winner by email and the winner will have 48 hours to respond to the email or a new winner will be selected. Please include your email address in the comment or have it linked to your comment. This giveaway is only open to US and Canada. I knew Logan would LOVE this movie, so I have already prepared some Cars themed literacy activities for the week! Come back all week and find free ideas of fun ways to play with cars... and learn a little too. my favorite is Guido, hands down! My 5 year old LOVES Mater though :D Thanks for the great giveaway!!! and I already "like" Cars on Facebook too :D THANK YOU!!! Jonathan likes McQueen-- we tried watching Cars a couple months ago and he loved it. It was pretty intense for him though! how cool!! Sammy loves Cars.. so we will for sure be seeing it soon after it comes out! My favorite character is mater.. he cracks me up!! Sammy's is lightning! I like Ready. Set. Read on facebook! My favorite Disney character ever has to be Rapunzel. LOVE her! I follow you through Google Reader. Russell said he likes Lighting McQueen the best. My son is crazy for McQueen! We love Mater in out house! I think Mater is my favorite - although I love all the characters! I subscribe to to Ready.Set.read in google reader! I like Ready.Set.Read on Facebook! I like Cars on facebook! My son and I love Mater! My favorite Cars character is Mater. I like Mater (love all the shorts they have made about him!) and Doc Hudson! I like Ready.Set.Read 2 Me on Facebook. I follow bookblogmomma on Twitter. my favourite disney character is Ariel - she's an inquiring mind and i like it! We love Lightning McQueen here! I am following cars on Facebook. 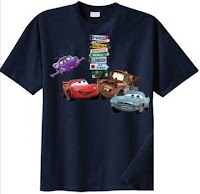 our favorite Cars character is Mater! My grandson is a fan of Doc....and of course, Lightning McQueen! My favorite cars character is Sally. My boys love lightning McQueen and Towmater. thanks for the great giveaway! everyone in our family loves tow mater the best!